Karen Creates Cards: Merry Monday Christmas Card Challenge #102 - Use or create Mistletoe on your Christmas card. Merry Monday Christmas Card Challenge #102 - Use or create Mistletoe on your Christmas card. 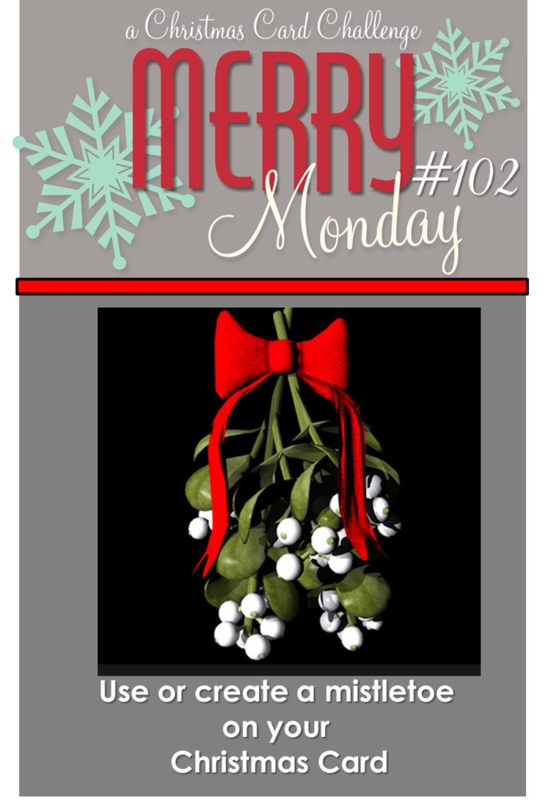 With this in mind, how about joining us for this Merry Monday Challenge to create or use mistletoe on a card. Slow down for a while, and immerse yourself totally in the process. For my card, I decided I could use these leaves (which are one of three branches on a Quickutz die) to create my Mistletoe. A few pearls created the berries. I wanted something other than a diecut frame for the card so I stamped and hand cut this lovely Frame stamp from Hero Arts. Once I had assembled these items it was just a matter of layering and adding a sentiment. Gorgeous! I love the black and green together with that pop of red jingle bells - beautiful!! Wow Karen. another jaw dropper! Simply beautiful! AWESOME design and the colors just pop -- LOVE this! Karen, your card is stunning! I LOVE the mistletoe and the design. So much great attention to detail! Have a great week! Just gorgeous! Those black accents are stunning indeed! Karen, this is absolutely stunning! I keep forgetting about my little jingle bells I bought! You reminded me :) Gorgeous card - have a super week! Karen I loved this post today. Wow! The black with white polka dots look amazing on this card. What a wonderful combination .simply stunning! So pretty Karen. Love the black and white banner, the gorgeous frame... the pearls and red bells are the perfect embellishments. I'm loving your die cut mistletoe with the pearl berries! Another masterpiece, Karen! And you're right about stamping being a balm to the brain! Delightful card Karen, love all the design elements, the colours you used and the DSP. Another beautiful card, Karen. The pearls on your mistletoe is a perfect touch! This is such a nice way to add a mistletoe and totally love that ribbon! Wow Karen, look at all these wonderful details and I love it all. Very stunning! You really rocked this one. Everything about this card is wonderful. This is just fabulous, Karen! Love everything about this card--wonderful use of that frame stamp! Gorgeous card, Karen! I love the black paired with the green, red & white! Love the addition of the little red bells too!